The Today Show in my Backyard! You may have read about my “She Shed” when we had it built a couple years ago. In the months since, she’s really evolved into my “Art Shed,” where I’m able to go out and have my own space to just create. Since those first days, my husband helped me design and add shelves, and he put in electricity so I could use my $5 chandelier. I have tried to have all the elements be recycled, so for a work table, we bought a desk at a garage sale and added a larger top so there was a bigger work space, and then castors so I can roll the table out onto the brick patio on the nicest days, and create outside with more space. Some days I have my girls with me in the shed doing art projects, which is fun. My daughter had a friend over and they made some little art postcards together. I recently added a Bluetooth speaker so I can have music, too. It’s been such a wonderful blessing for me, helping me cultivate my creativity, but it’s also been great for my mental health. I am a busy mom with 4 kids and I run a business as well, and volunteer to do art in my daughter’s class. About a year ago, Dana O'Brien of A Place to Grow Recycled Greenhouses (my shed designer/builder) asked if she could have someone come by to photograph my shed for an upcoming book. 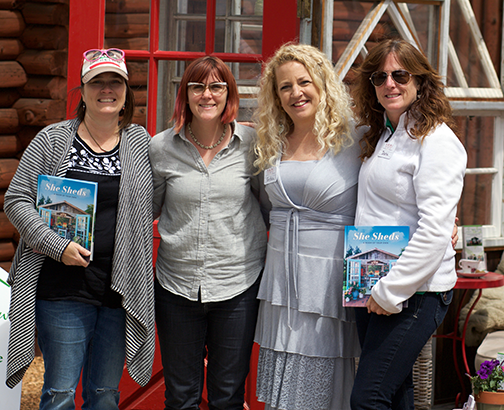 She told me the author of a new book on “she sheds” had approached her looking for she shed owners to feature in the book. Of course, I said, “Sure, why not?” My shed has been such a blessing in my life, my own little space, so I was happy to share it with others who might be inspired to do the same. Kim Snyder from Kim Snyder Photography and Dana came to stage the shed so it looked a little more put together than when I'm working in it. When I saw the photos, I loved them! Kim did such an amazing job of capturing the spirit of my workspace. After that, I didn’t really hear much for a quite a while. 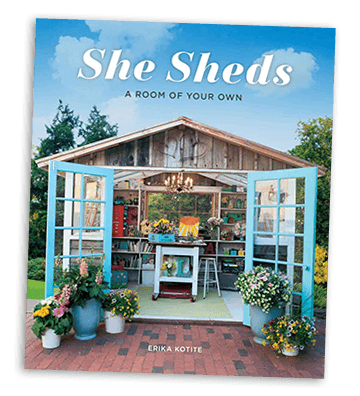 I didn't know it at the time, but the book’s author, Erika Kotite, decided to feature me and my shed in the book, and was even considering using it for the cover! I couldn’t believe it! Of course I was hopeful, but I didn’t know, and figured she had zillions of other sheds to choose from too. In the end though, she picked my shed to put on her cover! I was so honored! A couple months later, the book came out. It was surreal to see this place that is so special to me right there on the cover (not to mention my picture in a book!). Other than the excitement of seeing the book, I didn’t think a whole lot more about it. Life went on as usual, until one morning I got a phone call totally out of the blue, EARLY. I live in California, but because of Glitterfarm, it’s not unusual for me to get phone calls from all over the country and all time zones, so when I saw the East Coast area code at 6am, I sent the call to voice mail. “They’ll like me a lot more when I’m awake,” I thought. But the person kept calling, so I picked up and got my second shock. Turns out, it was a person connected to the Today Show, and she told me that Erika had suggested she contact me to feature my shed on the show. “Seriously?! Me? !” I thought. 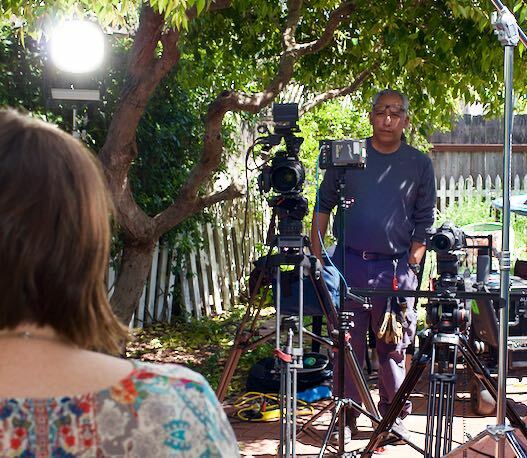 Like I did with the original request, I said, “Why not?” So, in about a week, I had a Today Show film crew in my backyard filming me in my shed, and me with the family and my girls! They were so professional, and so wonderful to work with. They spent the whole day getting footage of me working in my shed, and making postcards that have me obsessed these days. 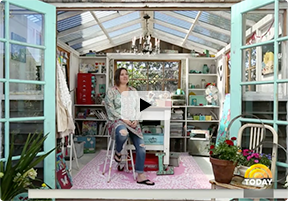 I got to share all about my shed and about the art I do, and how it helps me be a better mom to have a little “space of my own,” where I can just be me. Having to look at all these cameras and gear kinda freaked me out during the interview! 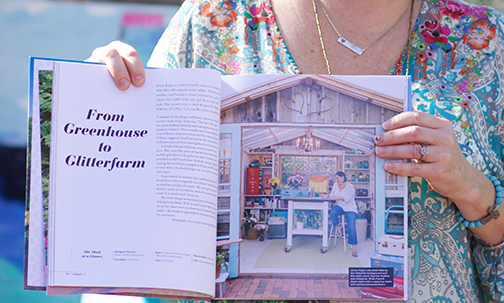 My Glitterfarm art shed story in Erika Kotite's book, She Sheds. There was a lot of "sitting around time" during the interview. Getting a close up of the post cards I've been making lately. Click to watch the Today Show segment. The segment ran at the end of June, while we were deep into some medical stuff for my husband. In fact, we'd just finished his prep for a cancer treatment and were checking out of our hotel at Stanford, when I started getting texts from all over the country. "I was at the Minneapolis airport and saw you on TV!" said one friend. Another was staying in Denver with friends and texted to see if she really saw me. I was thrilled! Here's the segment if you didn't see it. And if you want to pick up the book, here’s a link. Add your email below to get updates, discounts and more. ©2009-2018 Glitterfarm. All rights reserved. "Glitterfarm", "Organic Glamour", and the Glitterfarm logo are trademarks of Glitterfarm. Other company or product names may be trademarks or registered trademarks of their respective owners. My She Shed's on the cover of this fab new book! Check it out!